In the hustle and bustle of our world is today, it's easy to lose sight of the simple things in life that bring a smile to our face. For over 45 years, Ron Lee Sculptures have reminded us of the happiness that can be achieved in everyday life. Look closely, reflect, and smile, as you discover the simple charm that Ron Lee has created specially for each character. Please enjoy the artistry of Ron Lee. Brand New from Ron Lee! Introducing the new line of Beer Tap handles from the creative mind of Ron Lee. This incredibly unique set of functional sculptures are finished with a lead free metalized paint and acid oxidation and then antiqued and sealed with a satin clear coat. 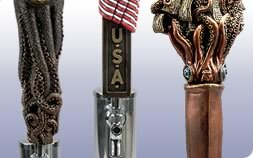 All handles are threaded with U.S. standard spigot threads (spigot is not included) and comes with a Certificate of Authenticity. 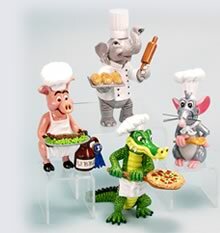 In honor of a passion for the Culinary Arts in our family, I have created a new collection of sculptures. This collection will comprise of animals from Air, Land, and Sea. As they stand alone, each character will display their culinary talents. Sculptures are made from lead free pewter, hand painted and finished with our newest colors and finishes. 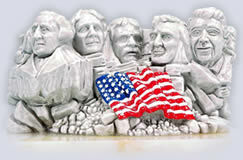 A tribute to Ronald Reagan, beautifully sculpted into Mount Rushmore by Ron Lee. » Purchase "Ronald Reagan in Mount Rushmore..." Today! Do you have metal or resin pieces you need produced? Ron Lee's has over 45 years of experience casting a wide variety of items in different materials. Receive Ron Lee News Updates! We invite you to sign-up today for Ron Lee's free email newsletter with all the latest news and updates.